Titles were celebrated across Europe this past week, with the champions of all four of the major European domestic leagues decided in one weekend for the first time in 27 years. I might have just made up that statistic, but either way, the synchronous nature of Manchester United’s, Barcelona’s, AC Milan’s and Borussia Dortmund’s titles is an oddity… at least in my often-cloudy memory. i have a feeling that this will be the fist of many trophies the city will be lifting. These league competitions are, no doubt, more favorably looked upon when compared to their less heralded siblings… the national cup competitions. Each has its own rich history, full of drama and intrigue. But winning a one of those cup isn’t celebrated and lauded in the way a league championship ever is. Perhaps that explains the lack of overwhelming outrage at Sergio Ramos for dropping the Spanish Copa del Rey a few weeks ago, such is the underwhelming allure of the Cup in Spain. In England though, everyone still likes to claim that the F.A. Cup is different. They say things like, “It’s the original football tournament,” or it’s “the oldest cup competition in the world”, or “every team in England theoretically has a chance to win it.” And all of that added together apparently means that it is full of a mystique that no human can possibly comprehend. Of course, everyone knows that this magical quality can most simply be boiled down to the intrigue of seeing the giants — full of wealth and prestige — being pitted against minnows from the lower leagues. It’s the lore of the tournament, and don’t you forget it! Though aside from the rare “giant killing” episodes, we often wind up with the same handful of dominant sides walking away with the trophy at the end of the campaign. It’s not that I don’t respect the F.A. Cup or enjoy watching its matches, nor do i think it’s not a big trophy. I just don’t think it’s as big of a deal as everyone tells me I think it should. This assertion probably has the sky blue half of Manchester reaching for their pitchforks about now, as they and their club are busy hocking about their long-awaited trophy like they just won the Champions League for the eighth year on the trot or something. How dare I undercut their only recent success?! Well, calm down Citizens. I’m not insulting your trophy. In fact, Citeh claiming the F.A. Cup is actually quite an important accomplishment… for Manchester City at least. What I’m getting at is that this cup win is the metaphorical equivalent of City finally ridding themselves of the monkey that’s been on their back for the last 35 years. sheikh mansour now has reason to believe that dumping more bags of money would be worth it. Regardless of the amount of money poured into a squad, that first trophy is always the hardest one to win. In City’s long-winded pursuit of achieving some sort of success, it took somewhere in the neighborhood of $566,000,000 to claim that prize. Such is the climate of today’s footballing world. Established giants — like Real Madrid, Manchester United, Bayern Munich and Milan — use their prior successes and the money built off of them to crowd out the minnows. So if City really wanted to break into the elite, they had to spend big to do it. It took a little longer than Sheikh Mansour and his Abu Dhabi billions had hoped, but now they’ve eclipsed their first hurdle and nothing but the a clean slate future awaits them. Combine that if they are able to secure guaranteed Champions League football, and suddenly the Citizens’ master plan becomes much more attainable than it had if they had gone home trophyless. If anything, these victories will no doubt vindicate the prince’s ambitious spending to this point, and likely encourage him to continue to do so. Even if the spending is on a smaller scale, the Manchester City chairmen has tasted his first sip of the footballing good life. There’s no way he won’t feel justified in spending some more to get his hands on unicorn or two more. 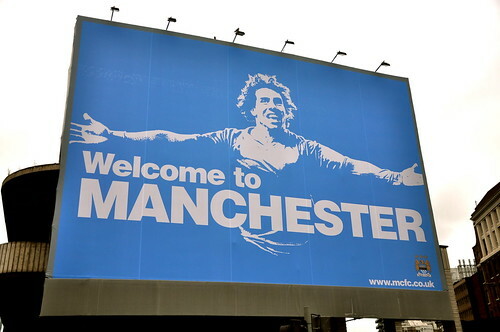 city’s provocative billboard seems slightly more appropriate now. Now I’m not saying that the floodgates have opened, or that they’ll win the quintuple every year from this point forward. But my guess is the next trophy won’t take another 35 years to track down, and it will be sooner rather than later. I just get this feel that this is what it looks like when a new dawn is rising in the world of english and european football. How much more City will have to spend and how long it will take and what other big names will arrive, I’m not sure. But spend they will, and arrive they shall, and all of the major clubs that are threatened by City’s ascension will mimic no doubt. And since Manchester City now have a victory in their rear view mirror and the monkey off their backs, they now stand as a legitimate threat to the establishment.